Mustard is one of the oldest spices, used extensively in kitchens and at dinner tables all over the world. It is an annual herb cultivated as an oil seed crop, or as vegetable or fodder. Three specific species of mustard are known for their condiment value. They are pale yellow or white mustard, brown mustard, and black mustard. Black mustard is a round hard seed, smaller and much more pungent than the white. 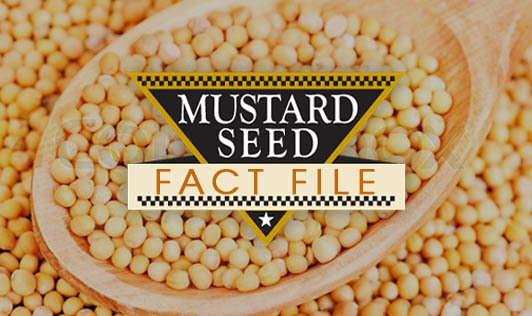 Mustard seeds contain good amounts of protein, fat, vitamins, and minerals. Hot water poured onto crushed mustard seeds and used as a foot bath is said to ward off flu and relieve headaches. The whole seeds after drying are used for pickling, preserving, and seasoning vegetables. In India, whole seeds are fried in oil or ghee until they begin to sputter, producing a milder nutty flavour that is useful as a garnish for other dishes. The brown seed is also pounded with other spices in the preparation of curry powders and pastes. Powdered mustard is usually made from white mustard seed and is called mustard flour. Mustard flour has preservative and antioxidant properties in addition to providing flavour and colour. Bengali fish curries derive their flavour and consistency from ground mustard. Dijon mustard is made from the husked black seeds blended with wine, salt and spices. It is pale yellow and varies from mild to very hot. This is the mustard generally used in classic French mustard sauces, salad dressings, and mayonnaise. Generally perceived as a health benefiting spice, mustard seeds are indeed very rich in phyto-nutrients, minerals, vitamins, and anti-oxidants. Being one of the chief oil seeds, mustard is indeed very high in calories; 100 g of seeds provide 508 calories. Nonetheless, the seeds are made of quality proteins, essential oils, vitamins, minerals, and dietary fiber. The seeds are high in essential oils as well as plant sterols. Some of important sterols are asbrassicasterol, campesterol, sitosterol, avenasterol and stigmasterol. Some of glucosinolate and fatty acids in the seeds include sinigrin, myrosin, erucic, eicosenoic, oleic, and palmitic acids. Mustard seeds are an excellent source of essential B-complex vitamins such as folates, niacin, thiamin, riboflavin, pyridoxine (vitaminB-6), and pantothenic acid. These vitamins are essential in the sense that the body can only replenish them through external sources. This B-complex group of vitamins helps in enzyme synthesis, nervous system function, and regulating body metabolism. 100 g of mustards provide 4.733 mg of niacin, also known as vitamin B3. Niacin is a part of nicotinamide co-enzymes that helps lower blood cholesterol and triglyceride levels. Mustard seeds contain flavonoid and carotenoid antioxidants such as carotenes, zea-xanthin, and lutein. In addition, the seeds contain small amounts of antioxidant vitamins such as vitamin A, C, and K.
The seeds are excellent sources of vitamin E, gamma tocopherol to be specific; contain about 19.82 mg per 100 g, about 132% of RDA. Vitamin E is a powerful lipid-soluble antioxidant, required for maintaining the integrity of cell membrane and the skin by protecting it from harmful free radicals. Mustards are rich sources of health benefiting minerals such as calcium, manganese, copper, iron, selenium, and zinc. Calcium helps build bone and teeth. Manganese is employed by the body as a co-factor for the antioxidant enzyme superoxide dismutase. Copper is required in the production of red blood cells. Iron is required for the red blood cell formation and cellular metabolism.